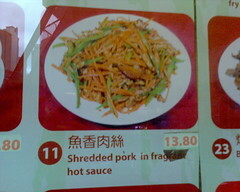 The English on this menu in China Town reads “Shredded pork in fragrant hot sauce”. Although, a literal translation of the Chinese 魚香肉絲 would be “fish-smelling shredded meat”. Which shows why the literal translation isn’t always what you want. This entry was posted in Humor, Photos, Words and tagged China Town, food, sign, translation, word. Bookmark the permalink.